I kind of get what you are saying. 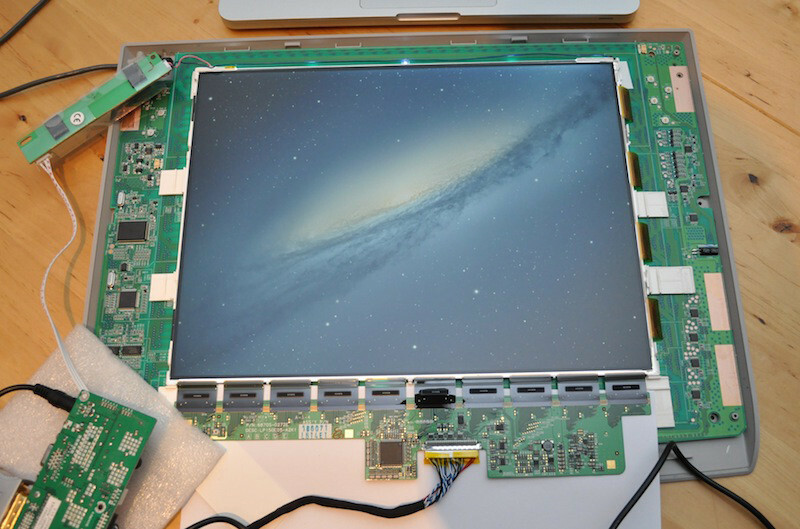 If I am not wrong, the LVDS would also have a ground wire right? Assuming it is grounded through the VGA that connects to the latptop / computer. Right, the ground is connected to the VGA/DVI outer shells and also to the inner wire of the power plug. The picture (hope this is ok with njytouch) shows the ground parts of the LVDS pcb which are connected to each other. EDIT: By the way, I'd recomment using the DVI connection. In my case, the VGA shows weird colours, some jitter and strange dark vertical lines on the screen. I propose for taking the conversation over to your build log at this point to keep it together. I've never been able to find an explanation for how to properly measure out the hole to cut. It's kind of awkward lining it up with the digitizer and the LCD. The LEGO bricks are keeping my LCD perfectly in place instead. Sorry if I missed this but how well did the LP150E05(A2)(K1) fit in your Intuos3? I'm planning on building a clone myself, attempted a build about 4 years ago but I found that the Dell 1503FP was too bulky and had issues with heat, that and I accidentally broke 2 panels! It's slightly higher thicker than the original middle layer but no issues with that, the cover closes entirely. I can vouch for these screens, too. A little dim if you like the tablet flat on a table, but awesome at an angle! Also how did you solve your CCFL cable issue? In this image the CCFL cable is ridiculously short. Did you replace the CCFL tube? Sorry for the late answer, for some reason I haven't been emailed about a reply this time as usual?! Yes, I changed the tube, mainly because it was fairly worn and I was worrying if it would be ok to extend it by soldering. But it should be possible to solder a longer one with at least the same diameter and similar isolation instead. The soldering should be done accurately in this case, as the tube runs on AC. I'd avoid having extentions within the cable, rather change the whole thing from end to end. Posts #4 to #8 really says it all. Love this build. I think I might try taking it on too. What do you mean by "It's slightly higer than the original middle layer " in regards to closing it all up? Thanks, glad you like it. The screen is just about one, two millimeters thicker than the original grey plastic sheet. Nevertheless the casing closes visually as before and you won't recognize any difference. It's hard to describe for me, the Intuos3's casing has not a clear defined closing gap because it's mostly closed with tape by default. The way the top and bottom casings come together provides some space for tolerance values. Thanks for the reply! I just got done reading the K-Jintiq thread you based your build off of; Did you end up having to cut the PCBs for the vertical scrolling as they did or did you find a way around that? Do you recommend any other build threads before jumping into this? Also, when you shield your circuits with conductive material [copper tape, aluminum tape, foil, etc], do you put a layer of electrical tape over the circuits first? I would imagine it would be tape, shielding, tape, right? Yes, if you don't cut them, they just won't fit in. But don't worry, this is really easy to do. These aeras/edges you have to cut off are just empty fields, without any circuits or parts on them. Guess they're made bigger than needed just to provide some more space for the tape, which keeps them in place by default. Afterwards I can say I could have removed the right one completely, since I have not touched it at all until now. I started my build right after reading the K-Jintiq thread, it really answeres all basic questions. Just wanted to add a few details here, but in fact a lot is kind of self explaining while you're working on it. The most terrible part for me was in fact to get the paint off the upper casing. Hell, that polishing thing was really a pain. But obiviously it just depends on the right chemical 'cocktail' to get it off without scratching it or leaving milky stains which have to be polished afterwards. And yes you're right, the shieldings should not touch any other circuitparts anywhere. Tape, shielding, tape is a good way to go. Yeah the paint part does look scary. I've tried buffing blemishes out of acrylic before and never had much luck, hopefully I can get through this without messing it up. I thought about making a mold of the cover and recasting it in clear resin, but I don't think I can get all of the air bubbles out and most clear resins I've used stay kind of flexible when so thin. Unless I misunderstood something said in the K-Jintiq thread, it sounds like some Intuos 3s have a recessed drawing area to account for the film and some are flat. Was yours recessed? It looks recessed but it is hard to tell. If it is, have you tried cutting a clear film to size and placing it, maybe an anti-reflective sheet or perhaps the clear version of film that Wacom offers? And how do you go able making sure the pen and the screen are perfectly aligned? Is it all about how you place it on the digitizer, or do you have to adjust the drivers to get it just right?